Going on a vacation with your kids and looking for things to do in Maine? Look no further! The past few whitewater rafting trips we've had here at Northeast Guide Service have offered the perfect activity for families looking for things to do with kids in Greenville. On Tuesday the 2nd, we had a few different families join us for some last minute vacation activities and the chance to enjoy the glorious whitewater that we all know and love. The weather wasn't quite sunshine, but the great young energy from all the kids kept us going throughout the day, and smiles lit up the room as we returned back to base for a slideshow presentation of the pictures from the day. With some of the youngest kids we've brought out on our full-day Kennebec river rafting, we had some great pictures that will solidify the memories forever. The Kennebec river is one of the best rivers for first time rafters and river veterans alike. As one of our most popular trips, we take kids as young as 8 down this river to give them a taste of what whitewater rafting really is. The kids on this trip were ecstatic when they got back, and I'm sure we'll be seeing them again in the future...maybe even some future Registered Maine Guides! River Guide Bourne helping out a future rafting guide on our inflatable kayaks. 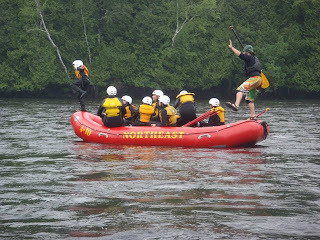 A few days earlier, on June 29, we had a summer camp group join our trip and try out our inflatable kayaks on the lower portion of the Kennebec River. It was a great experience for everyone, and learning how to kayak at summer camp is a memory these kids will never forget! Our inflatable kayaks are perfect for the inexperienced or for kids, no technique required- just sit and paddle! If you tip over, you get to swim a little, but then you can just get right back in and continue on down the river. By the time we were done for the day, they wanted to sign on to more! Our Two Rivers in Two Days package is a great way to do just that, and a great way to vacation on a budget! 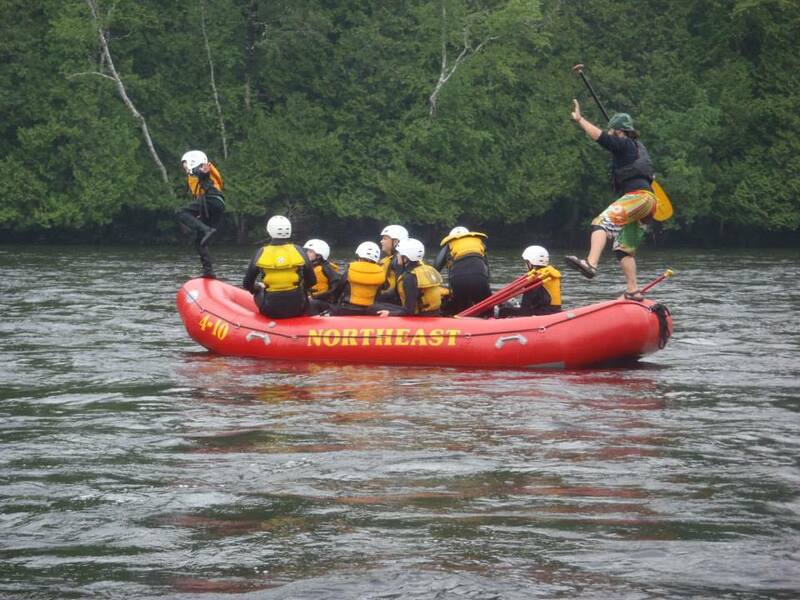 Special thanks to The Learning Clinic for joining us on the Kennebec! 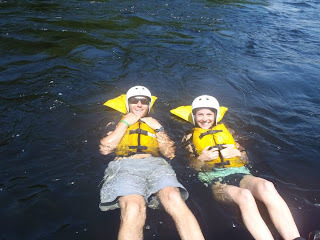 On July 5th, we had a great day full of sunshine and wonderful weather on the Kennebec River. We had a mixed group of people- many small groups and couples joining us for a day of adventure from all over New England. The day was so nice that just about everyone jumped out at Swimmer's Rapids, one of the last rapids before lunch that we actually allow guests to swim...on purpose! 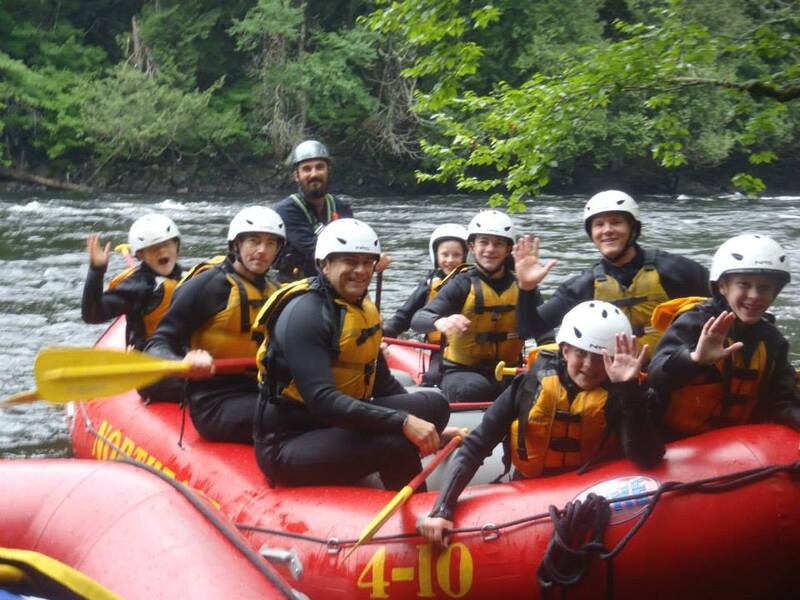 It's a great way to cool off and experience the rapids from a more "hands on" point of view. Throughout the day we managed to avoid sunburns (for the most part) and had the chance to enjoy a video of the trip to go along with our usual picture slideshow. "Hanging out" on the lower Kennebec and catching some rays!